It is easy to fall under the spell of Lake Como. At first it is the magnificent views that are so mesmerising. There’s the deep blue of the lake, grand villas half submerged by exquisite greenery, walls of oleander and poplar trees, boats dotted about in small harbours along the lakeside, chestnut forests covering the hills in the foreground and all this framed by the mountains of the Alps in the distance. But then there is a wealth of treasures that you stumble upon, enchanting medieval centres of lakeside towns, cafes and trattorias hidden in small harbours, markets laden with ripe fruit and vegetables, and small individual shops. Add to this beautiful walks, excursions on and around the lake, historical masterpieces, such as the cathedral of Santa Maria Maggiore in Como, and every moment is a journey of new discoveries. Como the main town is full of historical highlights and is still the silk capital of the world. Follow its western shores, all the resorts are linked by ferry, and dip in and out of little lakeside villages from Moltrasio to Tremezzo the location of the beautiful Villa Carlotta gardens with rare conifers and tropical plants and the setting for classical concerts during July and August. Further on is the elegant town of Menaggio with a stunning mountainous backdrop. Where Lake Como forms two branches you will find Bellagio right in the middle on a promontory. This little village is a network of cobble-stoned streets, and brightly painted houses with some magnificent grand hotels. Just outside is another gorgeous garden at Villa Melzi. Lake Como’s romantic landscape has seduced many a poet, writer, composer and artist over the centuries. A true Lakeland man, Wordsworth fell under its spell and loved the tranquility walking through the ancient villages and hillsides of olive trees. Daniel Craig in his first James Bond film recuperated at Villa del Balbianello at Lenno in Casino Royale. And George Clooney features regularly in lakeside commentary. He fell in love with Lake Como whilst filming Oceans Eleven, and his villas are pointed out on many a boat trip. The summer months on Lake Como enjoy a Mediterranean climate, which produces sub-tropical vegetation year round. Temperatures in July and August average between 25-28°C. Evenings can be cooler around 16°C. Water temperatures can reach 24°C in July. There is usually a nice cool breeze off the lake. Bellagio is one of the most picturesque towns on the lake. Its narrow streets lead up the mountainside, past bustling shops and restaurants, where you’ll be greeted with amazing views over the ink-blue waters. This little town is on the west shores of the lake, making it a great base to visit the nearby towns. It’s got a lovely laid back feel with a handful of shops, bars and restaurants. 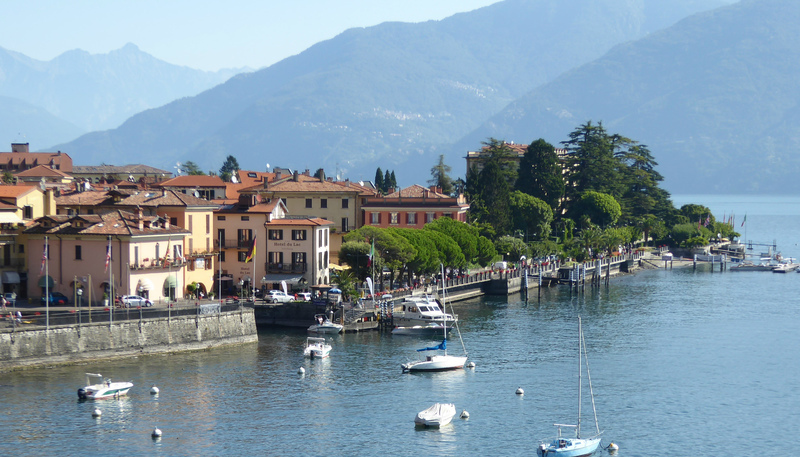 This picturesque town is at the southern end of Lake Como and set within 12th Century walls. It centres round a beautiful lakeside promenade lined with quaint shops and trendy cafés. Take the high-rising funicular for stunning panoramas. On the northern arm of Lake Como, Colico is surrounded by the Pian di Spagna nature reserve and Mount Legnone. With its picture-perfect location hugging the shore of Lake Como, Lenno is a great choice for those looking to get away from it all. The highlight of this village is the lovely promenade that’s lined with al fresco cafés. Menaggio is an elegant town that’s been established since Roman times. It’s surrounded by grand villas and its terracotta-roofed houses contrast beautifully with the blue of the lake and greenery of the mountainside. Moltraiso is centred round a small but lively harbour with a landscape of grand villas that ascend into its mountainous backdrop. Stretching across the west lake promenade, Tremezzo is in the area of Colonno/ Griante/ Cadenabbia and the island of Comacina, and has a particularly mild climate. On the lake the list of activities is plentiful from kayaking, to water skiing, swimming to sailing with many of the resorts and hotels having their own sports clubs with numerous facilities. There’s a regular ferry service and all sorts of boats available to hire. Menaggio has an 18-hole golf course and some great hiking above in the hills around Monte Grona. There are mountain biking trails around the lake and more strenuous tours into the hills and mountains. There are tours to some of the most spectacular villas and gardens such as the 17th century Villa Carlotta in Tremezzo with sculptures by Canova, Villas Melzi and Serbeloni in Bellagio and Villa Balbianello (discounted entry for National Trust Members) in Lenno. Hill, mountain and lakeside walks are all around Lake Como with miles of old mule tracks and well-marked footpaths. We have guided Wanderwalks for all levels and duration. The Greenway del Lago a 4 hr. walk explores a number of lakeside villages. Up in the hills there’s a network of old Roman roads that go through olive groves and ancient villages. A walk from Colonno to Cadenabbia passes the village of Mezzegra where you will find a cross marking the spot where Benito Mussolini was killed as he tried to flee to Switzerland with his lover Claretta Petacci. There’s a funicular from the village of Torno that goes to the hill village of Brunate. Many of the hotels from the grand era of the 19th century have large outdoor pools with scenic terraces. The Hotel Belvedere in Bellagio has an outdoor heated pool and Jacuzzi with a sunbathing terrace in the lovely tiered gardens. An extensive wellness centre has Turkish bath, sauna, gym, and full menu of beauty and massage treatments. Hotel Bazzoni in Tremezzo has an outdoor pool and Jacuzzi with sunbeds in a small garden. The Grand Hotel in Menaggio has a large outdoor pool at the lake’s edge with a spectacular view of the lake from its pool and terraces. There’s a Jacuzzi and sunbeds. Freshwater fish from the lake and rice from the nearby flatlands are essential ingredients in many of the local specialties. Risotto with perch fillets is Lake Como’s regional dish. Other specialities from the area include “missoltini” which is a fish called “agoni” that’s caught between May and June, sundried and pressed with salt in wooden barrels. Carpione and alborelle are also small lake fish that are fried and marinated fish in water and vinegar, cooked with fresh herbs. Whitefish Tremezzina fish soup with pike, small trout, and other fish is also a local dish usually served with rice. Resta of Como is a dessert made from dried and candied fruit. It has small olive twig in its mix, which represents peace and good fortune. Staples in the more mountainous regions include polenta and there are always a number of local cheeses. Balotas are small balls of polenta with a cheese filling. You will also find “rustisciada”, from Brianza region made with pork loin and sausage and onions. There are many vineyards in Brianza and on the northern west end of the lake above Domaso. The Valtellina is another area of vineyards producing the Valtellina Superiore DOCG wine. Since its beginnings in 2008 this incredible celebration of music on the waters of Lake Como has been a staple of Como town. The town itself becomes the stage with performances taking place at various locations from the stunning Arena Teatro Sociale di Como to courts, towers and the gloriously restored Medieval villas dotted along the shore. With concertos to suit every taste from Neoclassical to jazz lovers, to experience this celebration of art, dance and music is a once in a lifetime opportunity. 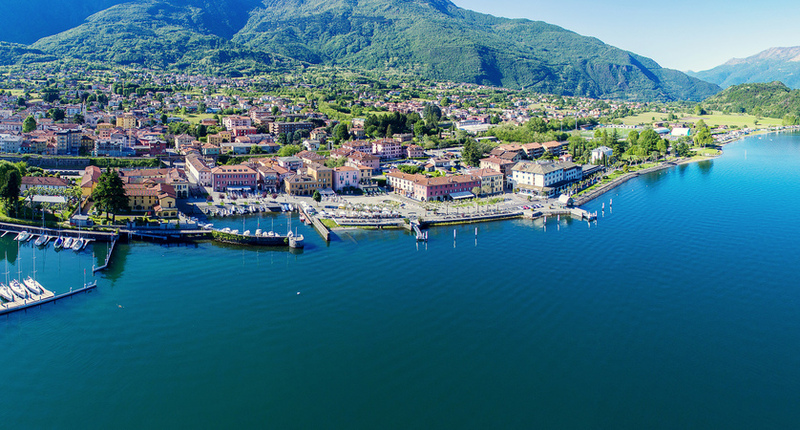 The Bellagio Festival in July and August is a series of concerts, films and varied recitals that take place in many of the lakeside towns. The concerts are held in gorgeous settings such as churches, piazzas, parks and castles. This fantastic and locally run sight seeing tour is certainly not something to miss. This multi-lingual hop on/hop off bus service takes you from Piazza Garibaldi right up through Lecco to the colourful harbour town of Varenna, the stunning crystalline waters of the Orrido di Bellano gorge and the majestic Castello di Vezio. Tickets for the bus service can be bought at local offices and prices range from €20.00 per adult for a return all day ticket to €10.00 for an evening ticket returning at 11.45pm. There are also child tickets (ages 5-15 years) available starting at €10.00 with children under the age of 5 travelling for free. The idyllic lakeside villas of Como have always attracted the rich and famous. Today they are reminders of more elegant times. Villa Balbianello, with its magnificent gardens and views should not be missed. 17th century Villa Carlotta in Tremezzo contains sculptures by Canova and 4 acres of gardens with azaleas, rhododendrons and ancient cedars and sequoias. In Bellagio, Villas Melzi and Serbelloni can also be visited; entrance is around €8.50 (reductions for over 65's). Even today, these villas retain their glamour. We offer a range of guided excursions to help you make the most of your holiday. All guests staying in Bellagio will need to make own way by ferry to pick up point. Cost is approx €10 return (pay locally). This full day excursion to St Moritz includes the famous Bernina Express train from Poschiavo and takes you through breathtaking scenery. By coach we take you up the northern arm of the lake, and into the majestic Val Valtellina, one of the great valleys of the eastern Alps and producer of the area’s splendid wines, meats and cheeses. Our first stop, for coffee, is at the small town of Tirano with its notable cathedral. We then proceed to Poschiavo for the highlight of the day: a spectacular ride on the Bernina Express, past glaciers, over dramatic gorges and viaducts, as far as Diavolezza, covering the highest part of the journey which climbs the steepest gradients in the world (of up to 70%) without the use of cog wheels. It is then a short and scenic journey on to St Moritz itself, where you have free time to take in the stunning views over the crystal lake, explore and admire the shops and to have lunch. Our descent, by coach, is no less dramatic. We take the unforgettable road down through the Maloja pass, with extraordinary vistas offered at every moment. The final stop is back in Italy, at the charming, historic town of Chiavenna, the ‘key’ of Italy, where you can explore the town’s attractive, cobbled streets and shops. The city of Bergamo Alta has been described as the prettiest open-air museum in the world . Birthplace of the opera writer, Gaetano Donizetti, this sophisticated and stunning small town contains no building newer than the seventeenth century. The cobbled streets contain medieval towers and wonderful views at every turn, and the main piazza is one of the most beautiful in all Italy. We start our excursion from the picture-postcard, historic village of Varenna, on the eastern shore of Lake Como. Cost of ferry ticket to pick up point not included. (approx €8 return). We then travel by coach along the scenic eastern shore of the lake to the town of Lecco and on past mountain scenery to Bergamo. You will then have free time for lunch and to explore the town. Bergamo is well known for its meats, cheeses, wines and specialities, both savoury and sweet. You may wish to make your way to a scenic viewing point or visit one of the excellent museums. Or you may simply wish to browse the smart shops and picturesque streets. In the afternoon we join our expert city guide for an interesting and entertaining tour around some of the streets and monuments, including the church of Santa Maria Maggiore, one of the greatest churches in northern Italy, and the chapel of the great condottiere, Bartolomeo Colleoni, which adjoins it. Taking the panoramic road along Lake Como’s ‘arm of gold’, skirting past Como, we stop for a coffee-break outside Milan. En route you will receive general instructions about the city and a map, before starting the tour with an expert guide who will first take you around the extraordinary Renaissance Castello Sforzesco, one of Milan's great monuments which was once Europe's greatest fortress. Then enjoy many of the sights, ancient and modern, from the comfort of the bus, with a full live commentary from our expert guide, until you arrive at La Scala, the world’s most famous opera house. You will then be treated to an entertaining and informative guided tour of the historic centre of Milan, making your way from La Scala through the Galleria Vittorio Emanuele, to the Cathedral itself. The awe-inspiring Duomo, the third-largest in the world, has the largest stained glass of any cathedral and yet has an ethereal quality conjured up by the pink-veined Candoglia marble and the intricate details of its façade and roof. Then you are free to enjoy the afternoon you wish. Whether you would like to take the chance to visit one of Milan’s renowned art galleries or museums, including La Scala Museum, sample the designer shops, department stores, enjoy the unrivaled views from the top of the Duomo, or simply enjoy exploring the elegant streets, or the lovely Brera district, full of charming bars, cafes and the site of the famous Brera Art gallery, you will find all these options within a few minutes’ walk. Lake Orta, only twelve kilometres in length, has been described as the most romantic of all the Italian lakes. It inspired Browning and captured Nietzsche's heart. We first visit the lake’s enchanting town of Orta San Julio, set on a garden peninsular and overlooking the island of San Giulio. Orta’s streets are too narrow for cars so it makes exploring the cobbled streets a breeze, lined with shops, bars and restaurants and ancient buildings. All streets lead to the handsome Piazza Motta which offers a stunning views over to the island of San Giulio. Lake Maggiore is a majestic, blue lake and the second largest of the Italian lakes, at 65 km in length. We visit Stresa, the ‘Pearl of Verbano, and Maggiore’s most beautiful town, at the foot of imposing Monte Mottarone, which has a cable-car running to its peak (4.920 ft). The town, which has a charming piazza and large number of shops and bars, hosts a famous series of concerts from the end of August to the end of September. The lakeside promenade is celebrated for its lush vegetation and flowers, including oleanders, mimosa and azaleas. Included in the price of the tour, is a visit to the Isola Bella by private boat (entrance to the Palazzo Borromeo and its gardens at additional cost). The gardens were inspired by the ‘hanging gardens of Babylon’ and Count Borromeo fashioned them into the shape of a ship for his wife, Isabella, giving the island its name. The palace houses a fine collection of art. BOOK LOCALLY | Prices are for guidance only. Please note: We act at all times as selling agent for the suppliers of activities & excursions. See terms & conditions. Guests staying in Moltrasio need to book all excursions locally. Prices correct at time of publication and may vary up or down.